Carpets help to define a room, brighten it up and are known to add definition to a room. With the right choices, tips and guidance, you’ll be using carpets to change your space into a modern home in no time! One of the most popular and used forms of flooring tends to be wall to wall carpeting. Wall to wall carpeting is boring and often is not even recognized as it simply blends into the room. But you’ll be proven wrong, as Miriam Fanning, the founder of the Australian Firm Mim Design says,” I love the luxury of wall to wall covering and the simplicity of a single finish.” Used and incorporated in the right way, wall to wall carpeting can add a minimalistic approach to a room with a luxurious flair. Try out a grey wall to wall carpeting with light brown and white furniture color scheme, with a few light green plants here and there, and voila! You’ll have yourself a beautiful, open and airy new room. Usually wall to wall carpeting is used in bedrooms and studios. You may have already sworn off obnoxious carpets with Zebra prints and bold bright colors such as a royal blue or a bright lime green. But they can add a lot of character to a dull or sober room that has a brown or cream color scheme. But you should steer clear of bold carpet choices if your room already boasts loud pieces of decoration. 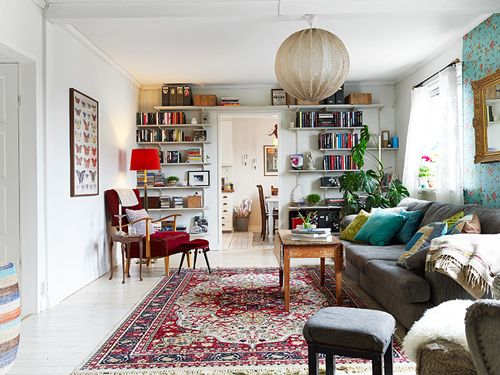 Adding bolder carpets could only lead to a very cluttered and confused room. Try going with a subtle colored carpet with rooms like that. But if you think that you have a designing knack, you could always choose to go with a bright color scheme for your room with even more bolder carpet as long as they all play out. You can decorate rooms with more than one carpet and there are a lot of ways you could do this. 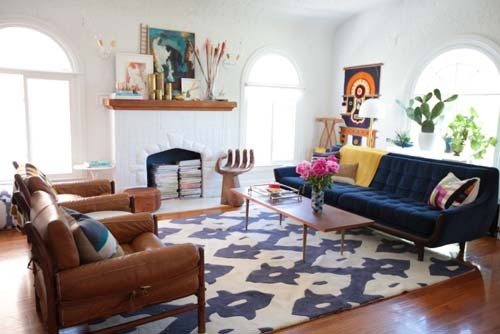 You could go with a more bohemian look by layering carpets on top of each other. You could also choose to place them separately, just make sure the carpets and their designs and colors do not clash with one another. A simple way to avoid this would be to buy one carpet with a block color and to buy another carpet with a pattern. You could also play with the textures of the carpet; one carpet made out of faux fur and the other, plain. Have a studio or a conjoined dining room with a living room? A carpet can help you to separate the living area from the dining area. Choose a different colored carpet for each area or a different patterned carpet, and see how much they stand out on their own. Do keep in mind that the space is still one and therefore the carpets have to play along and harmonize with each other. Carpets are art after all. They require designing and need a skillful hand. So take your most intricate carpet with a beautiful design or a beautiful meaning and hang it up! The carpet does, again, have to play along with the other pieces in the room. You may want your favorite carpet in the room. Well then style your room around your carpet! If you have a Moroccan styled mat with reds and whites, play around with wooden floors and orange and magenta cushions on comfortable white and grey sofas. Usually traditional carpets with history and ethnicity can be balanced with chic and subtle furniture such as plush white sofas and black glass tables and metallic decorations. Carpet weaving was brought to Nepal by Tibetan refugees in the 50s and 60s when they left their homeland to enter Nepal and India in huge numbers. Nepalese- Tibetan carpets are known to contain a high level of hand processing and are known to be made with a lot of care and effort, infused with motifs that relate to their culture and religions. Currently 95% of the carpet production is known to be concentrated in the valley.